TrustRadius is excited to publish our second edition of the Buyer&apos;s Guide to Business Intelligence Software. The updated guide is a distillation of more than 2,250 ratings and in-depth reviews of 22 leading BI software products on TrustRadius. All ratings and reviews were contributed by authenticated end-users, and many were written or updated in the last year. We believe that the most useful insights come from first-hand users, particularly in a category like Business Intelligence, where there is such a wide variety of available tools at all price points, all with very similar marketing messaging. As always, each reviewer was vetted and validated by a TrustRadius team member. The result is a reliable, independent analysis, uninfluenced by vendors or anyone else with an agenda. In addition to reading and distilling every single review, we spoke with vendors and experts to offer differing viewpoints on the direction of the BI market in 2016. As with our other buyer&apos;s guides, we hope this report will help you select the BI tool that best fits your needs. 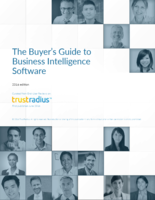 The first TrustRadius Buyer&apos;s Guide to Business Intelligence was published in November 2014. That guide segmented the market into different product types with different advantages and disadvantages, with some types being more suitable for specific use cases. The guide contained separate TrustMaps for the two principal product groupings: traditional full-stack platforms, and more agile data discovery and visualization tools. Dashboards and predictive analytics were the remaining adjacent product types. While these two major segments still contain sets of products that are quite unlike each other, the emphasis on speed agility in today&apos;s business climate has brought the two segments closer towards each other as they both endeavor to provide data for rapid and informed decision-making. Indeed many larger organizations use products from each major segment to solve different and specific problems. However, the impetus towards decentralized and agile decision-making has rendered the strict division of tools less clear cut than it used to be and, for this guide, we have not segmented BI products into separate full-stack and data visualization TrustMaps. 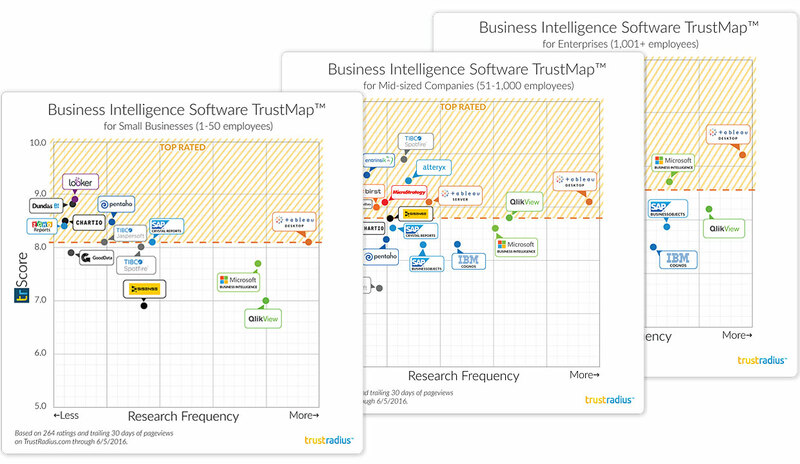 Here, TrustMaps are segmented according to customer size. As always, we&apos;d love to hear your feedback on the guide.